There are a number of different players in the API enablement space but most of them agree on the fact that for content heavy APIs at least, there is a need to situate points of delivery as close as possible to the consumers of that content. I covered one vendors moved in this direction recently. 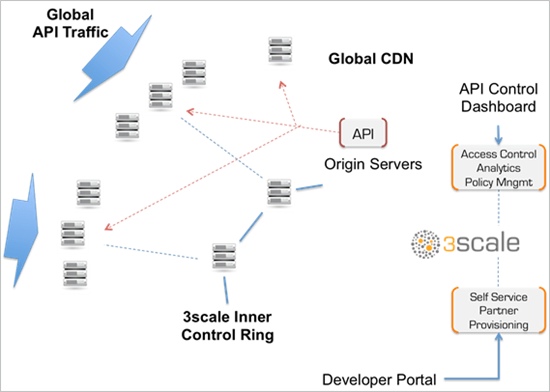 Latest to fulfil this need is 3Scale who have just launched partnerships with both Akamai and CDNetworks to deliver their API over these two players’ vast delivery networks. methods calls to the API can be cached within the CDN using standard caching controls on a push or pull basis. Keys for API access with detailed usage policies can then be controlled within from within the 3scale control system as well as auto-generated via the API Developer portal. Access to the API for applications is then via the CDN edge nodes that make calls directly to the 3scale control nodes in order to enforce policies without needing to communicate with the origin. The value proposition of this service is obvious – it speeds up delivery to users and offloads traffic from origin servers for scalability. New users are being offered a 12 month free trial only having to pay for bandwidth consumed in an attempt to show people the benefits a CDN can bring to API delivery. At the recent defrag conference I took the opportunity to talk with Steve Willmott from 3scale about the reasons behind this new offering, the video is posted below.